Mexico City. – For three days, from March 21 to 23, more than 600 people were selected to receive training and prepare themselves as Climate Leaders in Mexico City. The Climate Reality Project was founded by Vice President of the United States, Al Gore, and its purpose is to empower young people to talk about the consequences of climate change, as well as find practical solutions. 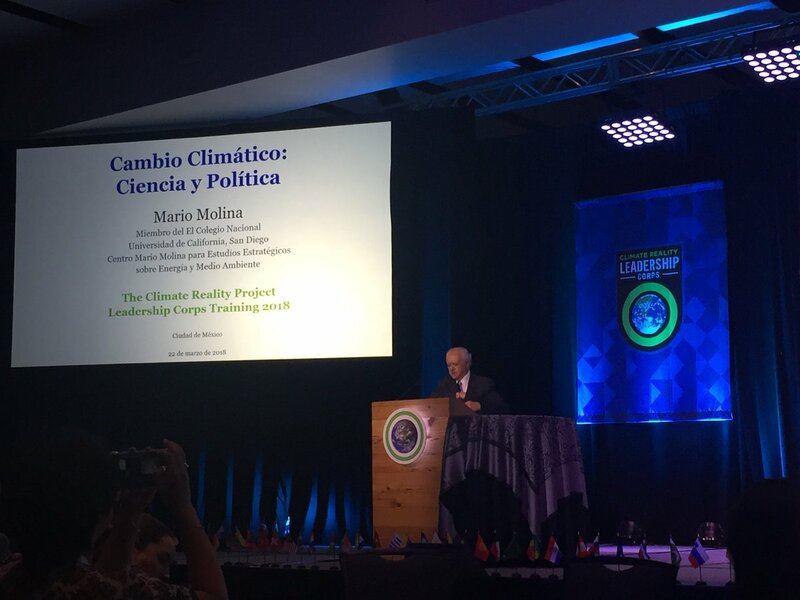 Dr. Molina made his presentation on the second day, entitled: “Climate Change: Science and Policy”. He began by explaining the commitment of the Mario Molina Center with the creation of public policy recommendations on environmental and energy issues. He focused on the importance of the term “sustainable development” and commented that this concept has evolved and is not only for future generations, but also for those present, since we are living the changes nowadays. Another concept that Dr. Molina explained is that of “Planetary Boundaries”. It was the result of a group of scientists who talked about the limits that we should not exceed on our planet. “There are nine limits and climate change is the first, the most worrisome and most serious we have, but it is not the only one and all are connected. Other limits include the acidification of the oceans or desertification due to the change in land use,” he said. Other issues connected with agriculture are the phosphorus and nitrogen cycles. An example given by Dr. Molina was the Mississippi River that receives the excess of fertilizers used in agriculture in the United States. This phenomenon takes the surplus from the rivers to the sea and creates phytoplankton blooms, which causes the oxygen to run out and thus creates dead zones, something that must be avoided. “Climate change is a problem with global consequences. Greenhouse gases (GHGs) are absorbed through the atmosphere, oceans and soils and clearly all countries must agree to address this problem together,” said Dr. Molina. “In this century, the temperature has risen to 1 degree globally in average. The climate is a complex system but speaking of probabilities, the Intergovernmental Panel on Climate Change (IPCC) determined that the probability that the temperature has increased due to human activities is more than 95%. We recognize the uncertainty, but in reality it is very small,” added Dr. Molina. He then spoke about climate change negotiations at the international level. After years of negotiations, and indeed in Mexico during the COP16 that took place in Cancun, a lot of work was done to get the Paris Agreement approved, and it was a historic achievement. The commitment is to reduce emissions to 2100 to avoid the temperature to increase more than 2 degrees Celsius and even more ambitious, no more than 1.5 degrees Celsius. However, Dr. Molina admitted that the reality is that even with the sum of the commitments of all countries, it is not enough to reach that goal. “If we want to do something as a society, we have to accelerate the commitments of the Paris Agreement. If the temperature of the planet raises to 5 or 6 degrees, it would be disastrous for humanity,” he warned. He finished his presentation revealing that science estimates different scenarios, but science cannot give judgements based on values. Society has to add ethics to issues. “Our common values ​​are that we want the good for humanity, not because science says so. We are talking about an extremely important ethical value of respecting the rights of the following generations,” he said.